Hot Pink | I adore wearing this shade in Spring for some reason so picking two items in this colour was an easy task. For lips I always go for Lipstick Queen Hot Rose Sinner, which is such a beautiful intense shade. The lipsticks in this range have 90% pigments, so they’re opaque and very long lasting, without being too matte or drying. Perfect for days when you just want your makeup to stay put! Combining this with a pink cheek, I had to choose Kevyn Aucoin Creamy Glow in Liquifuchsia which looks completely terrifying in person, but can be applied and blended in to give a natural pink glow to the cheeks! Orange/Red | You all know my love affair with the colour orange right now (see posts here and here), so it should come as no surprise that I had to add this colour in here. Lip-wise I’ve been going for NARS Velvet Matte Lip Pencil in Red Square, which is a gorgeous bright oranged toned red. It’s such a flattering shade and an absolute dream to wear! To match, I’ve picked Bobbi Brown Pot Rouge For Lips and Cheeks in Calypso Coral, which can be worn as a bright orange or a more toned down peach, depending on how much you blend it in. I love the formula of this cream blush and find myself drawn to it quite a lot! Raspberry/Berry | I love berry tones in Spring as much as I do in winter, as I think a nice raspberry shade looks wonderful with pink pastel shades and floral patterns. My lip product of choice in this colour is Maybelline SuperStay 24hr Lip Colour in Raspberry, as they last forever (seriously, try rubbing one of these off your lips, gurl it’s difficult) and the colour is so pretty! For cheeks, I adore Stila Convertible Colour in Poppy, as it adds a natural berry flush and the creamy consistency looks lovely on the cheeks. 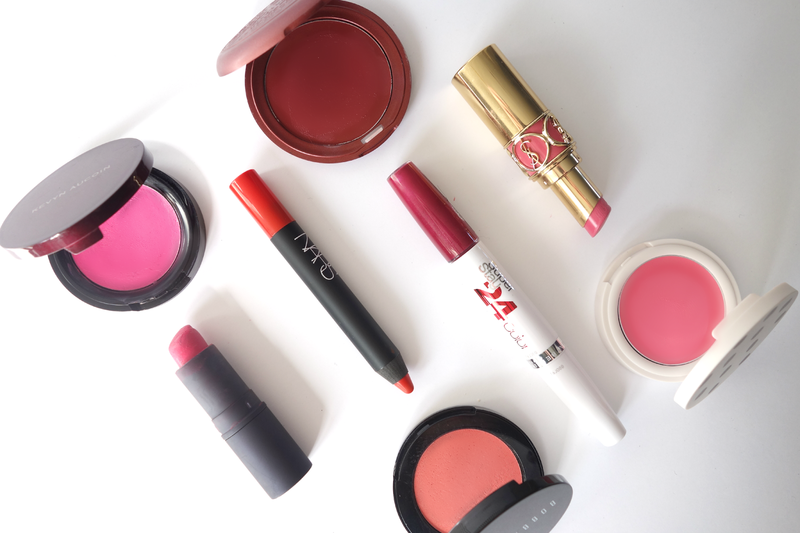 Light Pink | For those of you who are a bit more natural and girly with your makeup and shy away from really bright hues, I thought I’d include some lighter pink shades in my selections. YSL Rouge Volupte Lipstick in No.29 is such a pretty pink shade and with the formula being so silky, it sits well on the lips and hydrates them. Paired with that, I picked Topshop Cream Blush in Afternoon Tea which matches the lipstick perfectly. I love Topshop makeup (see full post with my top picks here) and their blushes are no exception, as they’re long wearing and easy to blend. What shades do you like pairing together? Let me know!